Image by joedawson via FlickrI could lose many hours attempting to understand the logic behind Leeds, the Inner Ring Road must have been built to prevent people leaving the city. We managed to escape yesterday, heading in the direction of Newcastle for the [birthday] reunion. 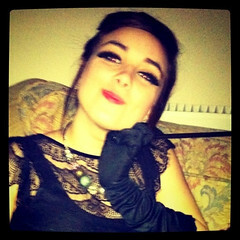 The first installment was a fancy dress house party! I was unable to secure a last minute special and opted instead for a Rat Pack-esque tuxedo. This was chosen as it related to my partner and her sister costumes, who looked beautiful, dressed as Audrey Hepburn and Marilyn Monroe. Also participating was my partners flat mate and his friend who was recovering from measles. Nice that! We arrived fashionably late but this meant that we had limited time to change and prepare for the event. We were soon changed and interacting with the other party goers, several tracks were rinsed but that added to the enjoyment. The main attraction was 'cat girl' and her pimp partner, who hadn't even come in costume. Not sure what they were about, my partner's sister could need a tetanus booster after 'cat girl' erotically scratched down her back. That should surely be confined to the bedroom?! This led to the end of their participation as embarrassed they departed soon afterwards. The party finished in the early hours, we slept on the sofa but were nervous that 'cat girl' and her pimp partner would return and drag us away like the scene from Paranormal Activity. Great night, didn't catch measles and looking forward to hitting the Toon tomorrow!